When we think about improving our landscape, we rarely think about how improving our hardscape could improve the landscape as well. This means installing new walkways, driveways, patios, and other projects around the landscape to heighten, protect, and beautify your landscape and your yard. This article will give you the basics of paver landscaping to help you design and construct your next project – or at least give you the information you need to feel comfortable dealing with a paver contractor or designer. As described elsewhere on this site, concrete pavers offer the homeowner many benefits that make up for its relatively high price of installation. Note that much of this also applies to pavers made from other materials, such as brick pavers and natural stone pavers (like flagstone pavers, bluestone pavers, sandstone pavers, etc.). One of the benefits of landscaping with pavers is that your installations will hold up over time, regardless of any weather or other stressors. The flexible aggregate base underneath will buckle and bend with freezing and thawing of water, as will the landscape paver installation itself (due to the joints between paving stones). The patio, walkway, etc. will thus not crack as would concrete or asphalt. This is especially useful when your pavers have an aesthetic quality to them – i.e. they are there primarily to look nice. Having them crack and fall apart would mar your otherwise beautiful project. In addition, building walkways and patios and borders around and in your landscaping can help protect your meticulously created landscape. 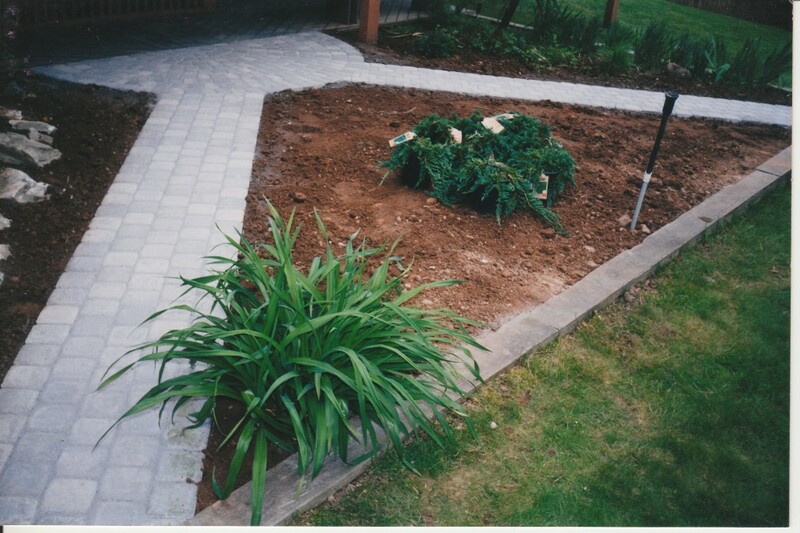 Landscaping edging pavers are a great way to both separate different sections of your yard while also protecting that which must not be stepped on or disturbed. These landscape pavers, regardless of how you use them, will not clash or not fit together – they are no different than any other concrete paver used for driveways, patios, or walkways. Thus, you can use the same materials throughout your yard, ensuring continuity and integration of your design. What is especailly useful about using landscaping pavers versus other options like concrete to decorate and separate other landscaping features is the design options possible. Paving stones come in a variety of shapes, colors, and sizes, offering many options for the homeowner or contractor to complement other features of the landscape or home. The different blends of colors available can bring match or complement any color palette. In the next section, we will discuss the various design options at your disposal, as well as some of the more interesting projects that you can add to your yard to enhance your landscaping. Should you create your landscape or your hardscape first? In a perfect world, the answer is ‘both.’ What you do with your hardscape should affect your landscape design and vice versa. When designing your pavers landscaping project, try to plan other paver installations at the same time. Not only is this more cost efficient than doing single projects, but you can also streamline designs across different projects. Your options to highlight and frame your landscaping are many; they include walkways, garden pavers, patios, pool decks, and retaining walls, among others. Note when designing your projects that you can use straight and curved lines throughout your design. Straight lines are more ‘formal’ and rigid, but are much easier to install. Curving lines are more informal and perhaps more interesting, but overall cost more money. Balancing out cost and features, depending on your budget, is a priority before you begin any project or contact a contractor. Here are some of the best landscaping paver ideas that you can implement in your yard today. Building a walkway or patio in your yard is a nice way for you to complement your landscaping while also creating a space for you and your family and friends to relax and enjoy each others’ company. Patio pavers are especially nice, especially when they are framed by fresh flowerbeds or other landscaping installations. One great way to highlight (literally!) 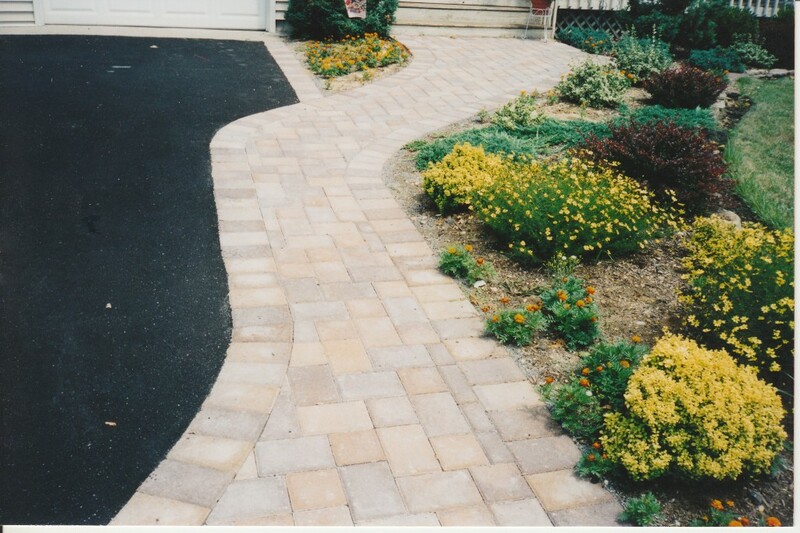 your landscaping pavers is to install paver lights around your walkway or patio. These can increase night time safety while also boosting the beauty of your home at night. Another way to highlight your landscaping is to put them at varying heights, not merely at ground level. This will often require you to build a retaining wall…which you can do with retaining wall pavers! You can thus use the same material – style, color, design – for your walls as you do for your flatwork. Building a paver retaining wall can serve a dual function – first, it can certainly raise the beauty and style of your entire landscape. But perhaps more importantly, it can protect your hard work from water and mud damage, especially if there are any steep slopes near your home. Retaining walls can keep back mud or dirt from sliding down a hill onto you beautiful lawn, patio, or other project. In addition, they can help properly drain water to avoid flooding – an important aspect of keeping your landscaping fresh and new. Note as well the benefits of installing pool pavers. The combination of your landscaping, paving stones, and the bright blue of the pool can make for a stunning look for any home and yard. If you need something more functional, consider adding grass pavers to your yard. This is a great way to keep your grass/lawn intact while making sure it is protected from the elements and vehicular traffic. Once you decide the basic elements of your landscaping paver project, sketch out a design and the dimensions of the parts. You will need this information to tell the contractor or, if you are doing the installation yourself, when ordering materials. Installing landscape pavers are in principle no different than installing concrete pavers in other contexts – it is merely the design and use of the pavers that may differ a bit. Thus, those interested in knowing how to do this should check out this page on how to lay pavers. This entry was posted in Project Ideas and tagged design, ideas, landscape pavers, landscaping, landscaping paver, landscaping pavers, landscaping with pavers, pavers landscaping by Will Grander. Bookmark the permalink.